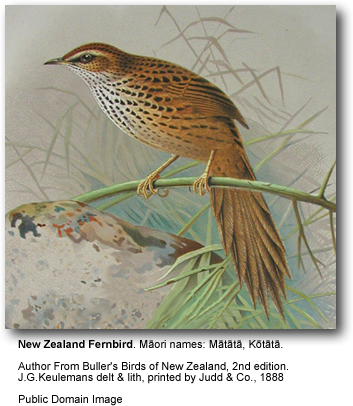 The Fernbird (Bowdleria punctata) is an insectivorous bird endemic to New Zealand. The M?ori names are K?t?t? or M?t?t?. The Fernbird is a ground-dwelling bird, and is a reluctant flier, travelling mainly on foot or in occasional short flights of less than 15 metres. It has suffered greatly in recent years from the reduction of its natural habitat (swamp land). It is a rich brown above and white below, with brown spots on both the throat and breast. The tail feathers are thin, dark brown, and spine-like. The birds reach a length of 18 cm (7 in). Bowdleria (punctata) rufescens (the Chatham Islands Fernbird) is believed to have become extinct circa 1900. The birds nest in sedges or other vegetation close to the ground, making a deep woven cup of dried rushes lined with feathers. Breeding occurs from September to February, producing clutches of 2-3 pinkish-white eggs with brown or purple speckles.